The first word you relate to Tarap, pungent. Yes its tarap season again. Don’t know what tarap is? 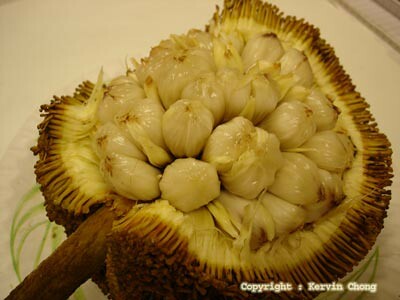 Well it’s a jungle fruit found only in Sabah and Sarawak as well as the greater Borneo region. There are no commercial plantations cultivating this fruit and thus availability is dependent on prospectors who venture into the thickets to retrieve them. When the season starts, truckloads can be found by the roadside hawking tarap with prices ranging from RM2 to 4 for a good size fruit. It looks like a rounded miniature version of chempedak or nangka from the exterior. 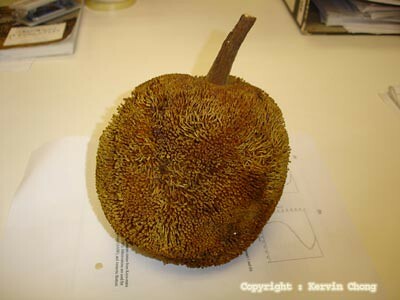 The greenish-brown (colours turn from a light green to a deep shade of brown when mature) outer coat is comprised of hundreds if tiny scale like bristles and will gradually soften as it ripens. The best way to determine whether the fruit you’re eating is ripe enough for consumption can be tested through two means. The first is the smell test and mind you it does smell. 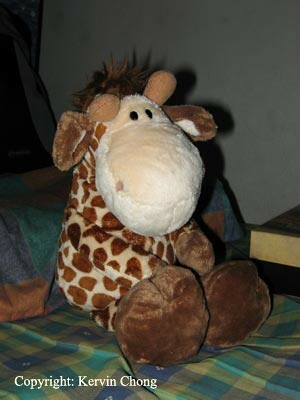 Leave one of these lying around in a closed room and come back later to find a veritable gas chamber as you step in. Why our discarded shell in the dustbin was notably in the air as we enter uni after our late night chow down yesterday. The smell will be a sharp pungent aroma even when the fruit is unopened, the stronger the smell the riper the fruit is. The best is when you can detect a faint whiff and not too overpowering before you open it. The other indicator is how you feel the fruit. Grasp both your arms around one and gently rub and squeeze the fruit. As it ripens, the hard fruit will feel a bit mushy in you grasp, a feeling akin to a pregnant woman’s belly as you can feel the inner fruits moving about. If fluid is dripping profusely from the fruit it could mean that the content within is already spoiling and should not be considered. Ripening takes only a few days and most tarap cannot be kept longer than a week. The fruits can be picked and stored in the refrigerator though but still shelf life is not too good and best enjoyed at once. Thus opening one, you just press your thumb into the soft skin and pry the pieces away and you’ll be greeted by a nicely arranged array of white fruits that looks like pale miniature chempedaks. They will be wrapped in yellow tendrils extending from the husk and stuck to the main stem of the fruit found in the center. To eat, just twist the fruit and pop it into your mouth, the center of the fruit consists of a single oval shape brown seed. A single tarap can hold as much as 150 to 200 fruits within. The taste varies according to fruit. Fruits not fully ripen will have a starchy bitter taste while an evenly ripe one has the taste of rosemary with custard. Over ripe fruits would give your mouth a strong taste of fermented alcohol. Unlike chempedaks the seed and fruit cannot be fried to make fritters though. Consuming too much can also give off a heaty feeling afterwards. I think if someone could come up with a gelato dessert for this it’d be heavenly. well... the taste is an aquired one... for an individaul to like this fruit... its quite hard... but if one likes durian... maybe... this fruit is a lil like cempedak but its a lil slimy... much more pungent though..
You auta la, if can take durian but can't take tarap hehe, didn't know you tried some before. So, that's what this is! I saw your photo at flickr and was so curious. You can really write! I feel like I am eating them. Thanks for showing me a new fruit! Never seen, heard or eaten before. 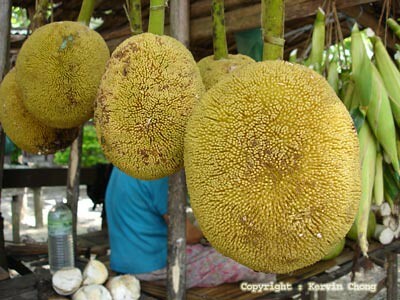 i'm from kuching i have never seen that fruit before. it rather looks like a furby, albeit a pretty ugly one. btw, are you the kervin tht participates in spunwithtears.com's thursday meme? Oh yes someone does grow them. I do in kebun on Labuan. Also Chempadak, dan buah buahan lain juga my man. anonymous: Didn't realise there were commercial growing of tarap in Malaysia. I'm sure if there were many more people would be acquainted with this delectable fare. Problem is how to export it, it ripens quite quickly if I'm not mistaken, once its ripe it deteriorates in less than a few days so exporting it can be a problem. I was in Sabah in 1998 and happened to be there when tarap was available. Straight out the best fruit that I have even had. The white pulp is like creamy vanilla. A must try for any adventous eater. I have not eaten tarap for so many years!!!! I just saw this fruit and mistakenly thought it to be the Nangka which I enjoyed eating. 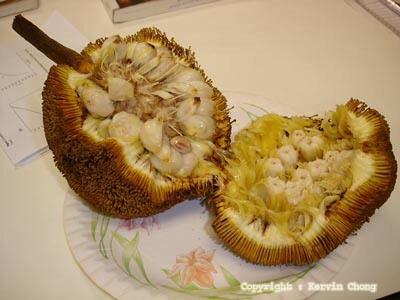 My forum friend from Malaysia pointed to its true origin & name and I think this is one other fruit I shall/must try when I visit Sabah/Sarawak someday soon. Thanks "Naim" for the header!!! 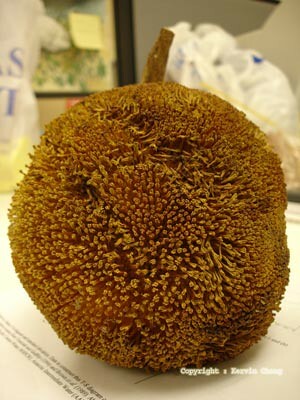 Hey, do you know what is this fruit call in English? i love that Tarap too,my #1 Borneo local fruit.available in northern sarawak,brunei,labuan & sabah. Oh I love that fruit so much. That's the best and my favorite fruit. I wish to have that everyday. I can't wait to go visit the Philippines to eat that fruit. They got sweet sweet tarap. This is one of my favorite fruits. I am a regular visitor to Sabah and never miss the chance to taste one while there. Considering everything, I think it's a toss up between Tarap and Mangosteen.